Child of Robert Waipa Parker born, 1889. 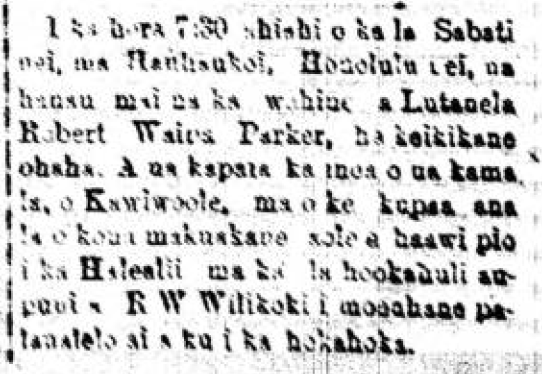 At 7:30 in the evening of this Sabbath at Hauhaukoi, Honolulu nei, born to the wife of Lieutenant Robert Waipa Parker, was a plump boy. The child was named Kawiwoole, because of the steadfastness of his father not to surrender the Palace on the day of the overthrow of the government [hookahuli aupuni] which R. W. Wilcox lazily dreamt up and was thwarted. Ko Hawaii Pae Aina, Buke XII, Helu 32, Aoao 1. Augate 10, 1889.